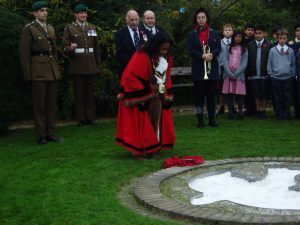 On Tuesday 1st November, the Mayor of Harrow, Councillor Rekha Shah, accompanied by members and a bugler of the British Legion, laid a poppy wreath in the Peace Gardens at Pinner Memorial Park, on the Dove of Peace, newly brightened with white marble dust for the occasion. Cllr. 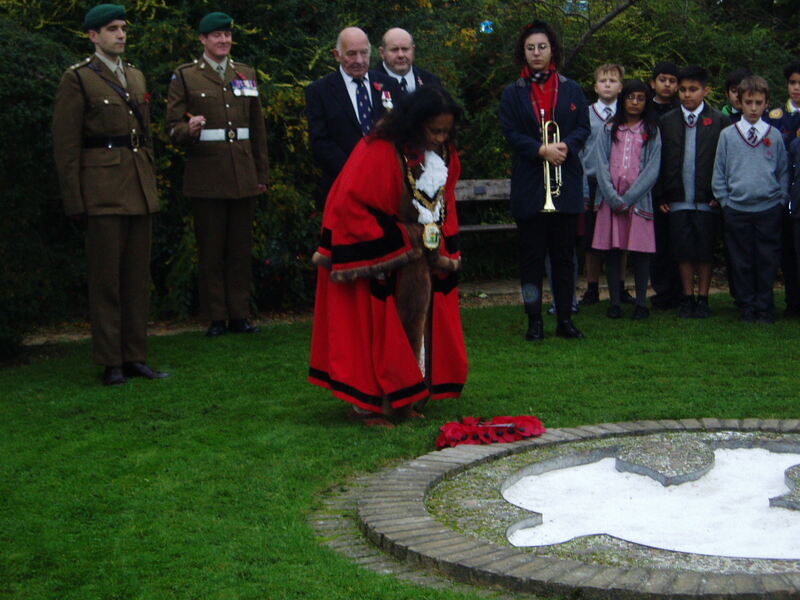 Rekha Shah laying a wreath at the Dove of Peace memorial, in the Peace Garden, Pinner Memorial Park. Ninety children from West Lodge School attended this important occasion and the head boy and head girl laid a wreath of poppies on the Dove. Afterwards, the children had the opportunity of visiting the new Heath Robinson Museum and were explained the history of West House and its gardens, now the Pinner Memorial Park, in which the Peace Garden is substantially maintained by volunteers from the Pinner Association for the enjoyment of all visitors to the park. This was a prelude to the annual Remembrance Sunday Service, organised jointly by the Pinner Association and the United Services Club, which will take place on Sunday, 13th November, at 10.40 a.m. at the War Memorial, High Street. Pinner. At this interdenominational service, some 40 wreaths will be laid by representatives of various branches of the armed services, of national and local government, local community, business and professional organisations, sports clubs, the Scouts and Guides and local schools. The bugler, as has been the case for many years,, will be a pupil of Nower Hill High School. It is hoped that many people will once again attend this annual Pinner event. Previous Previous post: Relocation of Pedestrian Crossings to be Completed!